The Hill revealed a bombshell of a story Tuesday morning that connects Russian bribery, collusion, the Clinton Foundation, Eric Holder, Uranium and tons of cash, all before the 2010 Uranium One Deal outlined in Peter Schweizer’s book, Clinton Cash (which if you haven’t read yet…come on get with it). 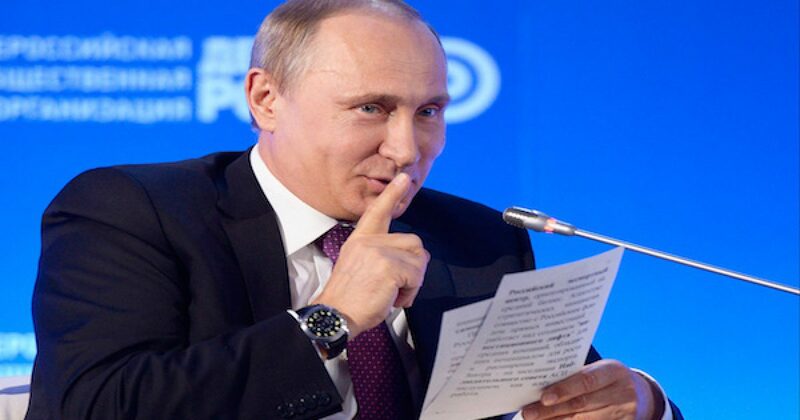 Apparently, the Feds had a mole inside Russia’s nuclear industry who gathered, “extensive financial records, made secret recordings and intercepted emails” that proved Putin’s people had bribed their way into an American uranium trucking firm, which of course is against the law (it’s called the foreign corrupt practices act which may be one reason why Piers Morgan is no longer in the country). Rather than starting to arrest people, or inform Congress, Eric Holder’s Department of Justice kept investigating Putin’s Nuclear corruption in the U.S. for four more years, while Hillary and the Obama administration were conducting two nuclear deals with the Russian despot. (…) In 2011, the administration gave approval for Rosatom’s Tenex subsidiary to sell commercial uranium to U.S. nuclear power plants in a partnership with the United States Enrichment Corp. Before then, Tenex had been limited to selling U.S. nuclear power plants reprocessed uranium recovered from dismantled Soviet nuclear weapons under the 1990s Megatons to Megawatts peace program. The sale of Uranium One and the concurrent hundreds of thousands of dollars of speaking fees to Bubba Clinton and mega donations to the Bubba and Hillary vacation fund the Clinton Family Foundation tied to people in the deal (while Hillary presided over the Committee on Foreign Investment in the United States) are all outlined in Clinton Cash. But FBI, Energy Department and court documents reviewed by The Hill show the FBI, in fact, had gathered substantial evidence well before the committee’s decision that Vadim Mikerin — the main Russian overseeing Putin’s nuclear expansion inside the United States — was engaged in wrongdoing starting in 2009. It gets even more suspect. at the time the Committee on Foreign Investment in the United States was approving the Uranium One deal, Attorney General Eric Holder, whose DOJ had evidence of the Russian Nuclear malfeasance was on that committee. Now in Holder’s defense, there is no evidence proving the AG or anyone else on the committee knew about the investigation–heck at the time Holder may have been busy hiding fast and furious documents. Vladimir Mikerin was Putin’s main man overseeing the expansion of the Russian nuclear business inside the U.S. Between 2009 and January 2012, Mikerin “did knowingly and willfully combine, conspire confederate and agree with other persons … to obstruct, delay and affect commerce and the movement of an article and commodity (enriched uranium) in commerce by extortion,” a November 2014 indictment stated (embedded below). It uncovered a new Russian money-laundering apparatus that routed bribe and kickback payments through financial instruments in Cyprus, Latvia, and Seychelles. A Russian financier in New Jersey was among those arrested for the money laundering, court records show. It exposed a serious national security breach: Mikerin had given a contract to an American trucking firm called Transport Logistics International that held the sensitive job of transporting Russia’s uranium around the United States in return for more than $2 million in kickbacks from some of its executives, court records show. Strangely, however, the DOJ and the FBI were strangely silent Mikerin, the Russian financier, and the trucking firm executives were arrested and charged. In fact, the only public notices was a year later when the DOJ put out a release saying the defendants copped a plea. Perhaps the silence was based on the fact that on April 12, 2015, Hillary Clinton announced her intention to succeed Barack Obama. Based on the latest information about James Comey and the email investigation we know the Obama Administration wouldn’t do anything to make Hillary look bad (she did that on her own).